Jasco Games is currently in the process of contracting out designers to both develop updates to the Megaman Board Game, as well as to begin designing Megaman the Board Game 2! We will have more updates as we get further into the process of updating this board game as well as developing the second Megaman the Board Game. We appreciate your continued support and dedication." 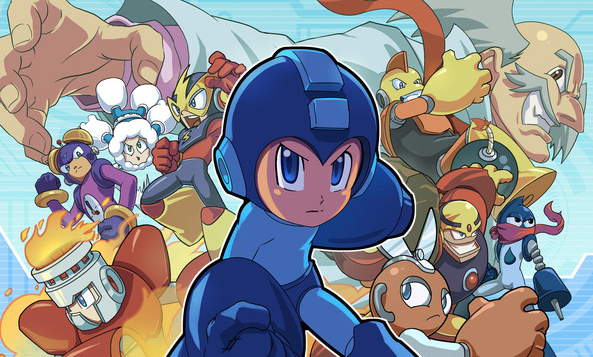 It remains to be seen if a Kickstarter campaign will accompany the new Mega Man board game. Either way, I'll keep ya posted. I heard the original board game was not that good, so I'm a bit surprised it's getting a sequel. It isn't terrible if you're a big Mega Man fan. It has it's flaws, and it takes a LONG time to play, but with the right crowd it's a wonderfully faithful game. Well… at least it'd be easy, to make a "Mega Man Board Game 2:" just swap out the weapons/bosses, like the real games. Wah hah! Only way I'd be interested in a new one, is if this is gonna be like the SF board game and have awesome big quality miniatures. Otherwise no. This is pretty much exactly how I feel. I bought it for collections' sake and while the figures are okay, I'd like better poses/quality and a larger size next time around if possible. I own the first game but havn't really played it. It seemed a bit complicated with the switching between Megaman and a Wily. I need to watch someone play it to fully wrap my head around it. yeah I never played mine either, it's a collection piece nothing more lol. Some friends and I tried to sit down one night and play it but didn't work out. Convoluted as hell. They'd have to REALLY improve the game system. I tried to play it once after purchasing and it is such a damn mess, and the instructions are incredibly unclear in my opinion. Not interesting. SKIP! BORED BOARD GAME! The rules were not bad, the game just took too long and the boss fights were boring. The best thing was the pvp in the wily event deck. The fact that they are aware of the games flaws and are contracting out is a good sign. How about an "ultimate edition" of the original? The only thing that kept me from buying it was the fact that it didn't include all the unique character tokens, and the thought of hunting them all down on the secondary market really irked me. Especially the "kickstarter exclusive" tokens. Not worth it! I think the time is right for a more consumer-friendly edition. Most, if not all, of the kickstarter studd is for sale from jasco's page. You csn get the Megaman variants, Dr light, minions, deck expansion, and ai think Yellow Devil.